This is a significant turnabout that illustrates how far out of time Satie was. The score for "Vexations" wasn't even printed until John Cage did so in 1949. The importance of this work to his own development cannot be overstated. In fact he organised the first complete play-through, in 1963, using multiple pianists including some of the most prominent names in new music: John Cale, James Tenney, David Tudor and so on. 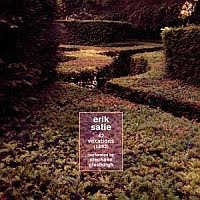 While sometimes included in "Complete Works" anthologies of Satie, of which there are many to purchase, those versions are truncated to just a few repetitions. This sensitive performance by Stephane Ginsburgh (on the Sub Rosa label) provides you with 42 repetitions. Play the CD 20 times to hear the piece at its intended length -- though this would not of course be the same as a performance lasting close to 24 hours, because of how the process affects the psychology of the pianist. Prior to listening, follow Satie's advice to the performer: "It would be advisable to prepare oneself beforehand, and in the deepest silence, by serious immobilities".